Disclaimer These slides are provided by Bureau staff for informational purposes only. Nothing herein is intended to supersede any provision of the Commission's rules or public notices. These slides should not be used as a substitute for a prospective applicant's review of the Commission's relevant orders, rules, and public notices. 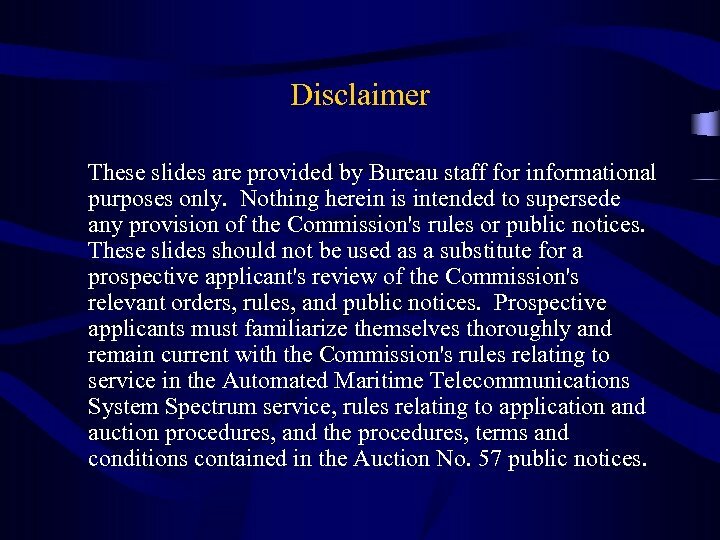 Prospective applicants must familiarize themselves thoroughly and remain current with the Commission's rules relating to service in the Automated Maritime Telecommunications System Spectrum service, rules relating to application and auction procedures, and the procedures, terms and conditions contained in the Auction No. 57 public notices. 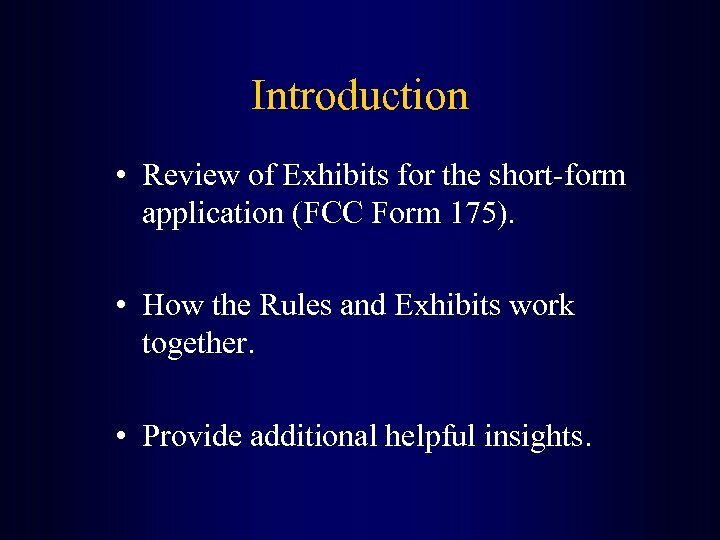 Introduction • Review of Exhibits for the short-form application (FCC Form 175). • How the Rules and Exhibits work together. • Provide additional helpful insights. 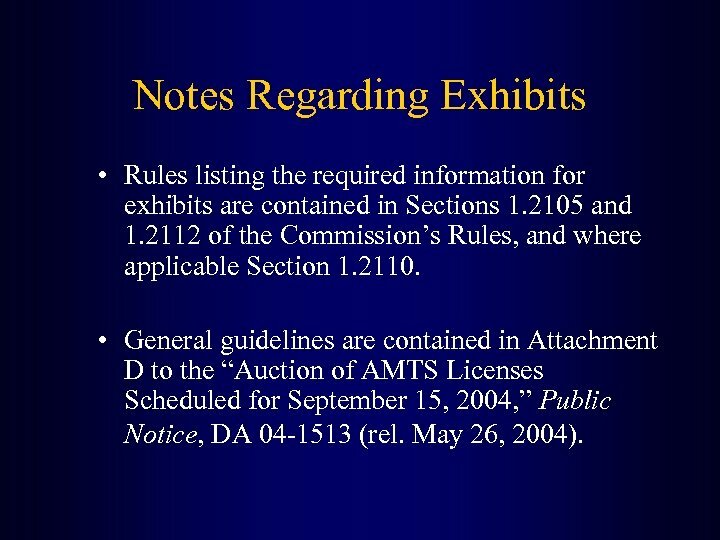 Notes Regarding Exhibits • Rules listing the required information for exhibits are contained in Sections 1. 2105 and 1. 2112 of the Commission’s Rules, and where applicable Section 1. 2110. • General guidelines are contained in Attachment D to the “Auction of AMTS Licenses Scheduled for September 15, 2004, ” Public Notice, DA 04 -1513 (rel. May 26, 2004). 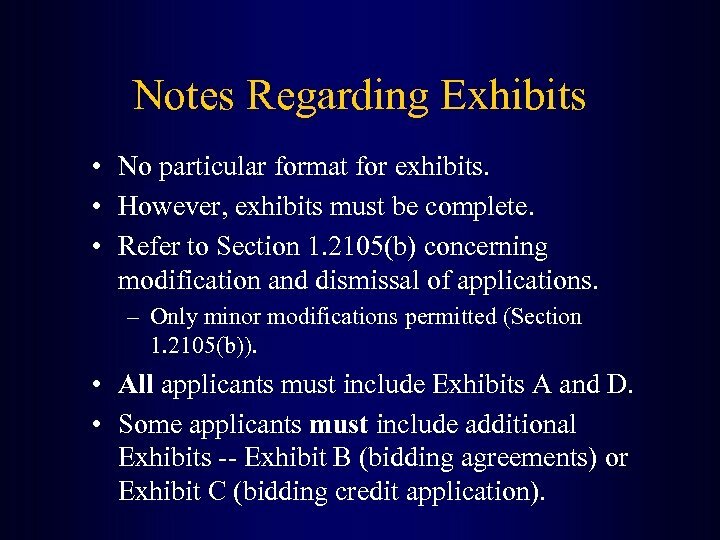 Notes Regarding Exhibits • No particular format for exhibits. • However, exhibits must be complete. • Refer to Section 1. 2105(b) concerning modification and dismissal of applications. – Only minor modifications permitted (Section 1. 2105(b)). • All applicants must include Exhibits A and D. • Some applicants must include additional Exhibits -- Exhibit B (bidding agreements) or Exhibit C (bidding credit application). 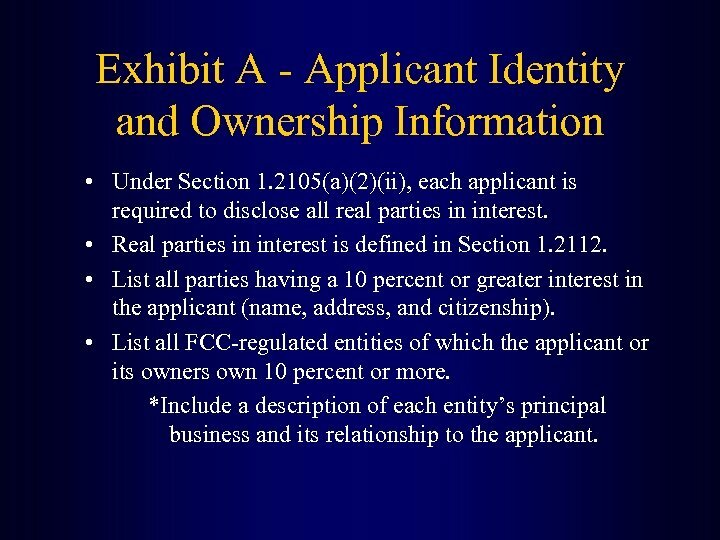 Exhibit A - Applicant Identity and Ownership Information • Under Section 1. 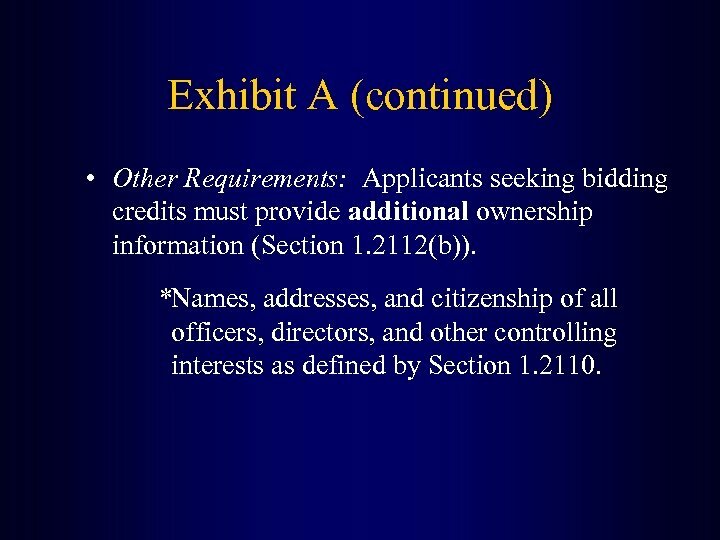 2105(a)(2)(ii), each applicant is required to disclose all real parties in interest. • Real parties in interest is defined in Section 1. 2112. • List all parties having a 10 percent or greater interest in the applicant (name, address, and citizenship). • List all FCC-regulated entities of which the applicant or its owners own 10 percent or more. *Include a description of each entity’s principal business and its relationship to the applicant. Exhibit A (continued) • Corporation: corporate name and address; and the name, title & citizenship of a responsible officer or director (Section 1. 2112(a)). • General Partnership: name, address & citizenship of all partners and their interest (Section 1. 2112(a)(3)). 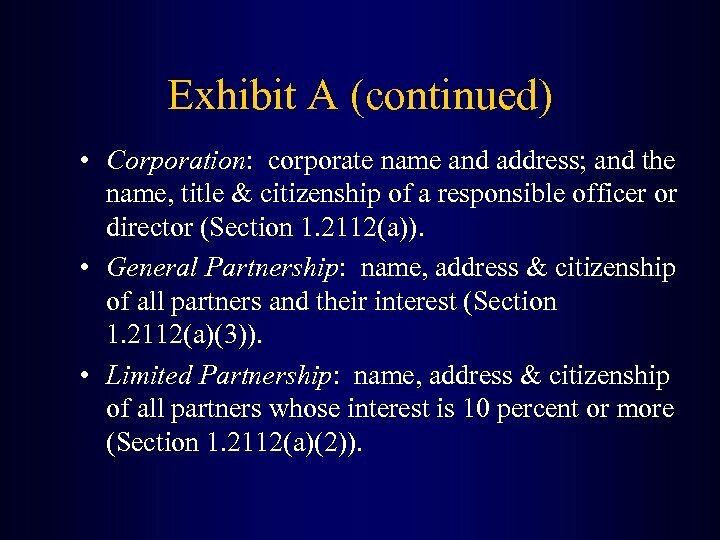 • Limited Partnership: name, address & citizenship of all partners whose interest is 10 percent or more (Section 1. 2112(a)(2)). 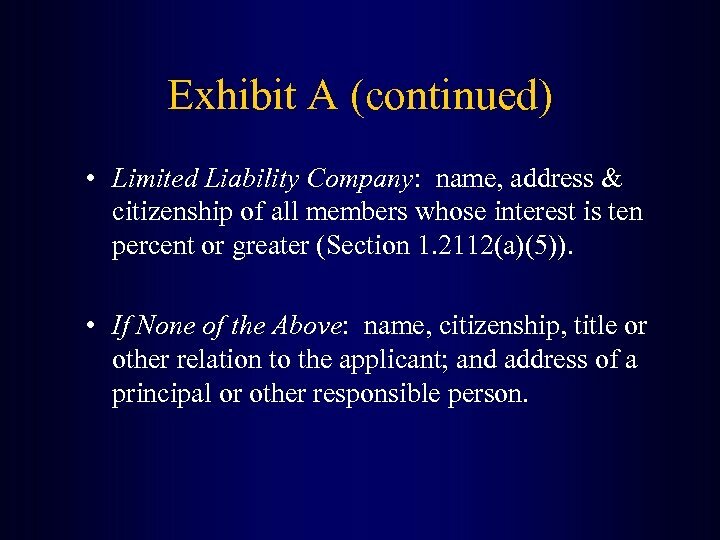 Exhibit A (continued) • Limited Liability Company: name, address & citizenship of all members whose interest is ten percent or greater (Section 1. 2112(a)(5)). • If None of the Above: name, citizenship, title or other relation to the applicant; and address of a principal or other responsible person. Exhibit A (continued) • Other Requirements: Applicants seeking bidding credits must provide additional ownership information (Section 1. 2112(b)). *Names, addresses, and citizenship of all officers, directors, and other controlling interests as defined by Section 1. 2110. 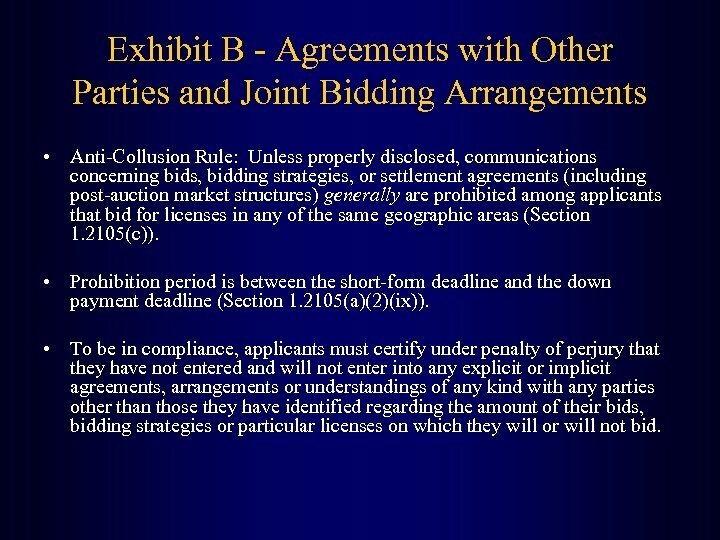 Exhibit B - Agreements with Other Parties and Joint Bidding Arrangements • Anti-Collusion Rule: Unless properly disclosed, communications concerning bids, bidding strategies, or settlement agreements (including post-auction market structures) generally are prohibited among applicants that bid for licenses in any of the same geographic areas (Section 1. 2105(c)). • Prohibition period is between the short-form deadline and the down payment deadline (Section 1. 2105(a)(2)(ix)). • To be in compliance, applicants must certify under penalty of perjury that they have not entered and will not enter into any explicit or implicit agreements, arrangements or understandings of any kind with any parties other than those they have identified regarding the amount of their bids, bidding strategies or particular licenses on which they will or will not bid. 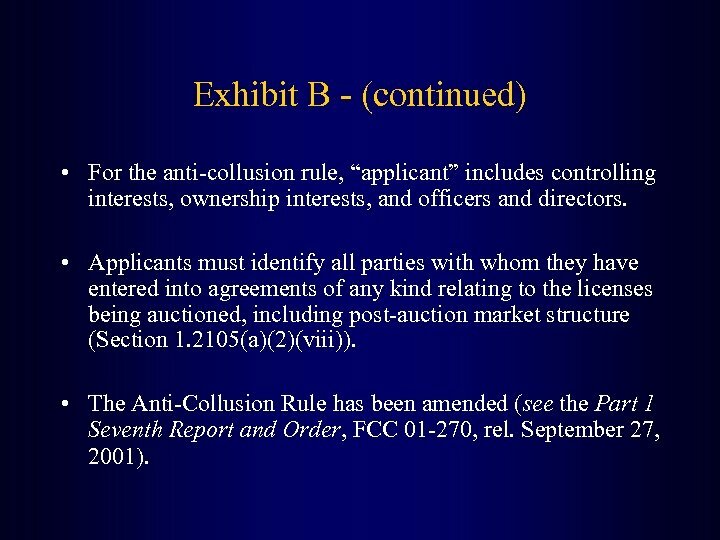 Exhibit B - (continued) • For the anti-collusion rule, “applicant” includes controlling interests, ownership interests, and officers and directors. • Applicants must identify all parties with whom they have entered into agreements of any kind relating to the licenses being auctioned, including post-auction market structure (Section 1. 2105(a)(2)(viii)). • The Anti-Collusion Rule has been amended (see the Part 1 Seventh Report and Order, FCC 01 -270, rel. September 27, 2001). 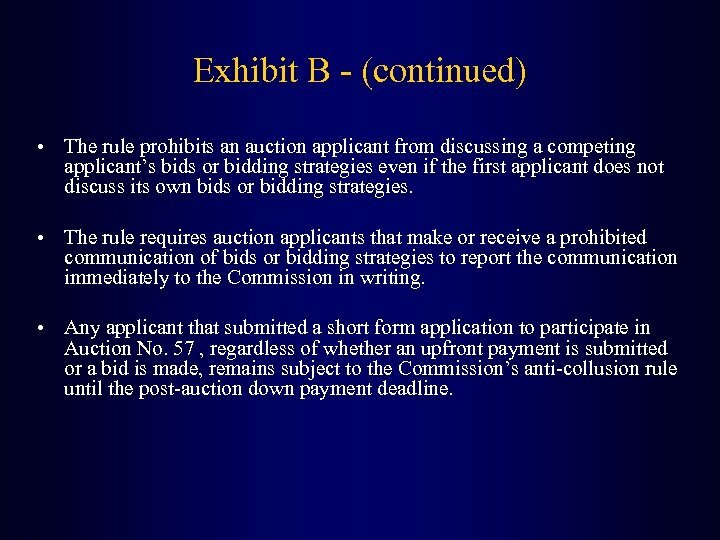 Exhibit B - (continued) • The rule prohibits an auction applicant from discussing a competing applicant’s bids or bidding strategies even if the first applicant does not discuss its own bids or bidding strategies. • The rule requires auction applicants that make or receive a prohibited communication of bids or bidding strategies to report the communication immediately to the Commission in writing. • Any applicant that submitted a short form application to participate in Auction No. 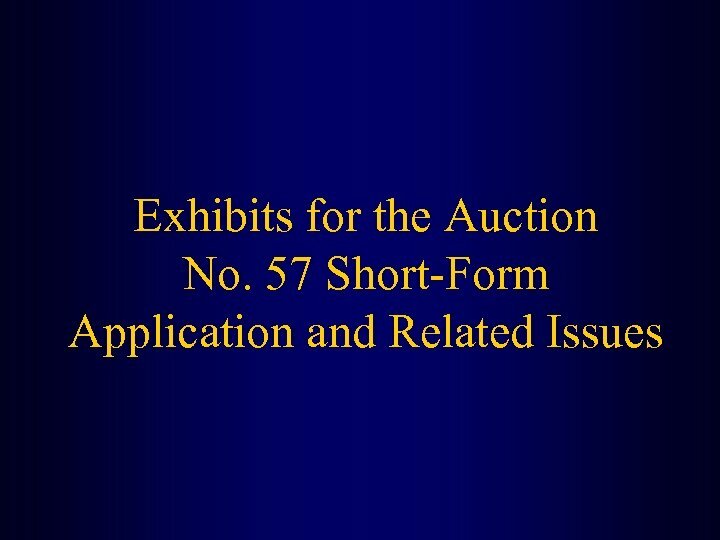 57 , regardless of whether an upfront payment is submitted or a bid is made, remains subject to the Commission’s anti-collusion rule until the post-auction down payment deadline. 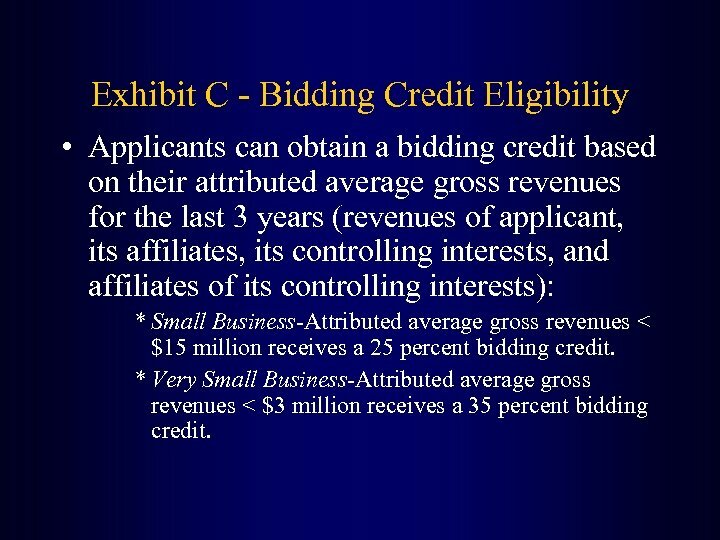 Exhibit C - Bidding Credit Eligibility • Applicants can obtain a bidding credit based on their attributed average gross revenues for the last 3 years (revenues of applicant, its affiliates, its controlling interests, and affiliates of its controlling interests): * Small Business-Attributed average gross revenues < $15 million receives a 25 percent bidding credit. * Very Small Business-Attributed average gross revenues < $3 million receives a 35 percent bidding credit. 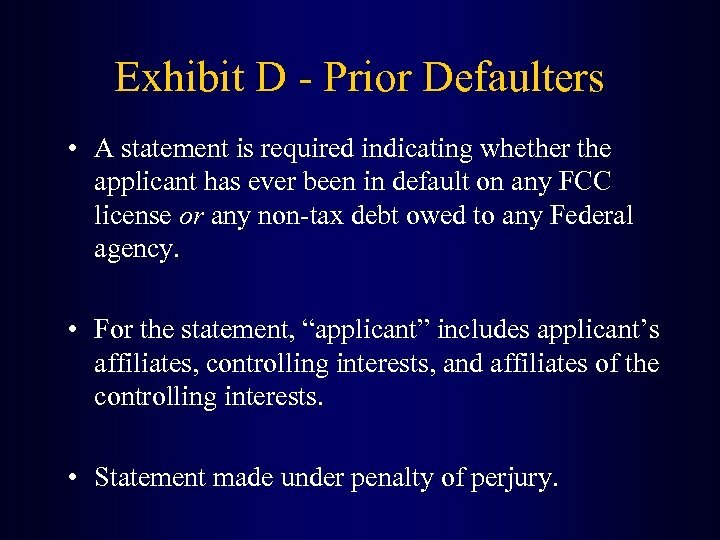 Exhibit D - Prior Defaulters • A statement is required indicating whether the applicant has ever been in default on any FCC license or any non-tax debt owed to any Federal agency. • For the statement, “applicant” includes applicant’s affiliates, controlling interests, and affiliates of the controlling interests. • Statement made under penalty of perjury. 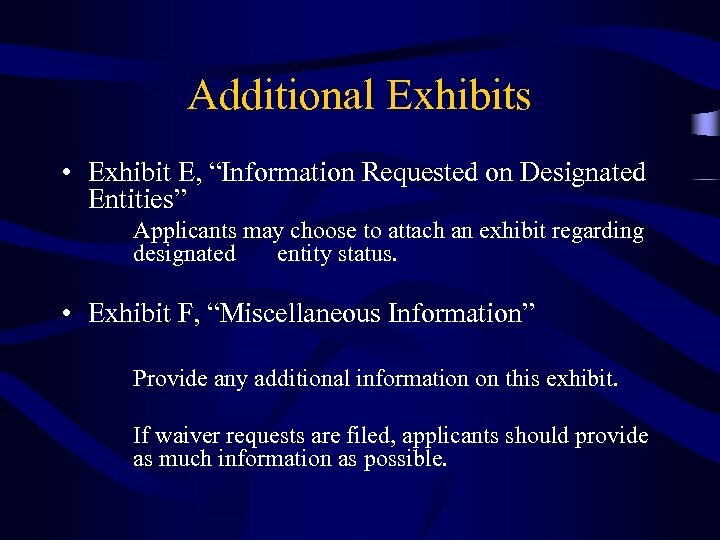 Additional Exhibits • Exhibit E, “Information Requested on Designated Entities” Applicants may choose to attach an exhibit regarding designated entity status. • Exhibit F, “Miscellaneous Information” Provide any additional information on this exhibit. If waiver requests are filed, applicants should provide as much information as possible. Some Last Key Points Remember that applications will be available to the public. – Therefore, do not list any taxpayer identification numbers (TINs) on the FCC Form 175. 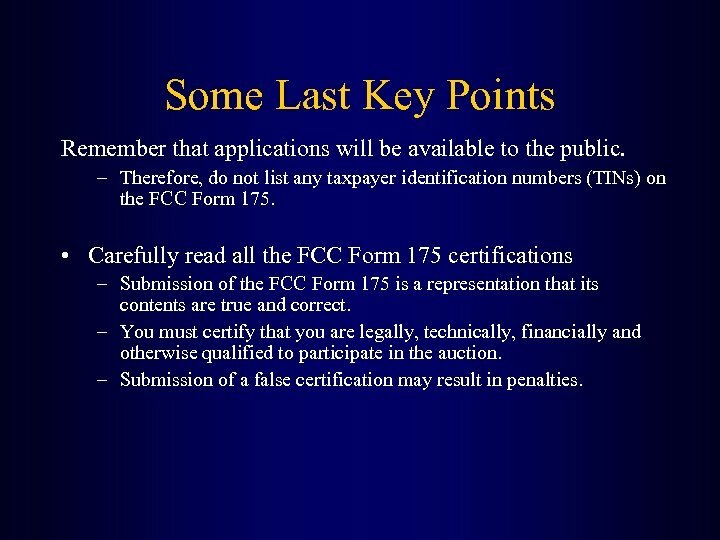 • Carefully read all the FCC Form 175 certifications – Submission of the FCC Form 175 is a representation that its contents are true and correct. – You must certify that you are legally, technically, financially and otherwise qualified to participate in the auction. – Submission of a false certification may result in penalties.